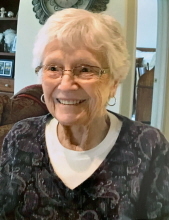 Dorothy Ann (Fernette) Theile passed away at The Meadows of Owosso on January 20, 2019 at the age of 90. Dorothy is predeceased by her husband, John; parents Alfred and Signee Fernette; brothers Oliver, Lawrence, Tom and Arthur; sisters Ruth, Catherine and Margaret, nephews Jim Fernette, Philip Fernette and Alan Teachworth; son-in-law David Howard. Dorothy will be lovingly remembered by her children Marvin (Mickey) of Ocala, Florida; Richard (Carol) of Owosso, Michigan; Pamela (James) of Roscommon, MI, and Peggy of McKinney, TX. ; her brother Charles of Corunna, MI; 10 grandchildren; 17 great grandchildren; numerous nieces and nephews. Dorothy was born in Corunna, MI and married John in Owosso, MI where they resided for their 61 years together. Dorothy was a member of St. Paul’s Church all her life where she enjoyed working funeral dinners and at St Vincent de Paul. She also was a member of the Corunna VFW Auxiliary. A Mass of Christian Burial will be held 10am Wednesday January 23, 2019 at St. Paul Catholic Church with Father Michael O'Brien officiating. Dorothy will be laid to rest at St. Paul Cemetery. The family will receive friends at Nelson-House Funeral Home, Owosso Chapel on Tuesday from 4pm to 7pm with a rosary being prayed at 7pm. Memorial contributions are suggested to The Catholic Community of Owosso. Special thanks to the staff and caregivers of The Meadows of Owosso and Memorial Healthcare Hospice. To send flowers or a remembrance gift to the family of Dorothy Ann Theile, please visit our Tribute Store. "Email Address" would like to share the life celebration of Dorothy Ann Theile. Click on the "link" to go to share a favorite memory or leave a condolence message for the family.